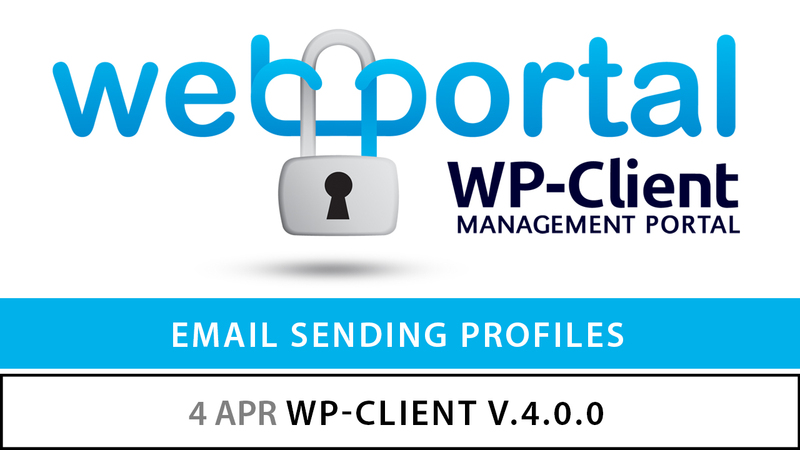 We are proud to announce the release of WP-Client v.4.0.0! This major update, and it’s recent family, includes several feature requests, in addition to the usual tweaks, bug fixes, and functionality improvements. Being a major update, WP-Client v.4.0.0 will be rolled out in phases over the next several days, and should be available to all customers within the next week. The feature that sees the most additions in this update is to file sharing. With the implementation of new modifiers, as well as some changes to the shortcode templates, there are now more options for displaying and sorting files for clients in their portals. New filter options have been added to allow clients to filter files by date range, allowing them to narrow down their files to specific dates. Additionally, some changes to file sharing shortcodes allow the option for file categories with no files to be displayed, if desired. Lastly, more options have been added to give admins further control over allowing clients to upload only specific file types, using include/exclude rules within the file uploader shortcode. To take advantage of these new changes, admins will need to perform a “Reset to Default” for their file sharing shortcodes in the WP-Client–>Templates–>Shortcode Templates menu. Another useful addition in this recent update is related to email sending. With this update, we have introduced Email Profiles as part of the email settings within the plugin. This allows the admin to setup and save multiple different setting “profiles” for sending emails, and easily switch between then as desired. This means you could easily setup Email Profiles for default WordPress, SMTP, Mandrill, and SendGrid email sending, and have all of them saved for used whenever you see fit. This allows you total control over how your WP-Client email notifications are sent to your clients, employees, and other users. Additionally, if you are utilizing our Newsletters Email Marketing Extension, the new Email Profiles will be available for use in the settings of that Extension as well. This release also include some smaller feature additions, such as the addition of address fields for the Authorize.Net payment gateway checkout process, as well as some fixes related to private messaging. Additionally, a few issues related to caching have been resolved, mostly related to the backend settings pages. A few other minor bugs have also been addressed, in addition to the normal streamlining and text updates.